Do you have an old or used truck for sale? Are you planning to sell your truck for cash in Brisbane, Gold Coast, Sunshine Coast, Toowoomba or anywhere in Queensland? Of course, you can try a plenty of options. But in case your commercial work vehicle is totalled in an accident then its value will drop quickly. Even if you think about making the necessary repairs it can cost you more than the vehicle’s actual price. Whereas if you try to break it for parts and sell it individually, it won’t be of much help. As it will drain out a lot of your time as well as energy. So, why not make a quick call to the best truck wreckers here at QLD Wreckers? We are well-versed in providing high quality truck wrecking services with more than 25 years of practice. With such a long history of experience, we can deal with any condition and size of truck. So, if you are looking to sell your old truck anywhere in Brisbane, we will remove it quickly for top cash. Call us today for booking free unwanted truck pickups. Why choose “QLD Wreckers” to Sell Your Truck? We understand that selling a commercial vehicle is a pretty difficult job. It will not only make you lose a lot money but also your precious time. Whether you have been using it for personal or work use, heavy vehicles are really hard to sell. But now this is a fairly simple job for truck owners living in Brisbane. As we offer incredibly easy junk truck removals services in the whole of the Queensland. If you really need an old truck buyer who can pay top cash, we are your perfect option. We don’t hesitate to offer a great deal of cash for every type of heavy automobile. It is because client satisfaction is our top priority and we even go out of our way to accomplish it. In fact, our seasoned auto removers work 24/7 offering free truck collection service in all of the Qld. Topping it all off, we make same day cash payments (Bank Wire Transfer preferred) before collecting the vehicle in question. Since we hold great many years of experience in the business of old and dead truck removals. We understand the customers desire to earn best possible money for their automobiles. This why we are ready to swap every junk vehicle with a generous amount of money. We have actually built up a commendable record in offering most competitive cash for trucks in the industry. You will without a doubt receive the highest possible value of your damaged wheels once you contact us. And, you will surely appreciate us after you get a free quote from us. The positive and praiseworthy feedback given by our huge customer base clearly justifies this. Make sure to check it on our website. Our experts can help you make top cash for trucks up to $15’000 after assessing your automobile’s condition. Apart from it we also consider the make, mode, odometer reading and year of manufacture of the automobile. We encounter many sellers who wonder if we only take specific models of vehicles. They do this because there are some cash for car companies who proclaim to buy all models and brands. But when the time comes to buying a vehicle they are often consider its make and model. But the cheerful news is that we don’t do any such thing. We never leave our customers dejected by rejecting their automobile. It doesn’t matter to us what make or model of heavy vehicle you want to sell. We just concentrate on offering you the most trouble-less service by accepting a vehicle. However, this is not the end of our list it includes every other brand that our customers want to offer. There is actually no such factor that can make us disqualify your automobile. After picking up vehicles we carefully transport them to our wrecking yard. This is where we perform environment friendly disposal of junk vehicles after dismantling them. So, first we make sure to disassemble every part of the automobile. It is analyzed carefully to find out if we can re-use it or not. If the part is recyclable we refurbish it using the best techniques. While steel and other metals are reconditioned to manufacture various items. This is indeed a really good of disposing vehicles for the benefit of the environment. It also helps us to drain out all the harmful substances present in the automobile. As we are an authentic and qualified truck dismantlers, we know how to handle an old and scrap automobile. Thus, we don’t have any preference about purchasing only specific condition of vehicles. We are happily going to buy it off you. No matter whether it has no working part, accumulated severe water damage, totally broken or in the worst possible condition. Even if you need to sell a brand new truck, we are ready to pay buy it for the maximum cash. It won’t matter to us whether or not you get it serviced and detailed. We will love to buy it as it is. Not only do we buy broken trucks for cash we also pick them up for free. We have the best quality equipment and tow trucks for this job. And, the extensive experience of our removal specialists makes it even the removal process even simpler. The happy part of the process is that you will get obtain instant hard cash without paying a single dime. That’s true. You can avail our removal service for 100% free. There is no need to pay any extra money whether your vehicle is in a good working or worst imaginable condition. 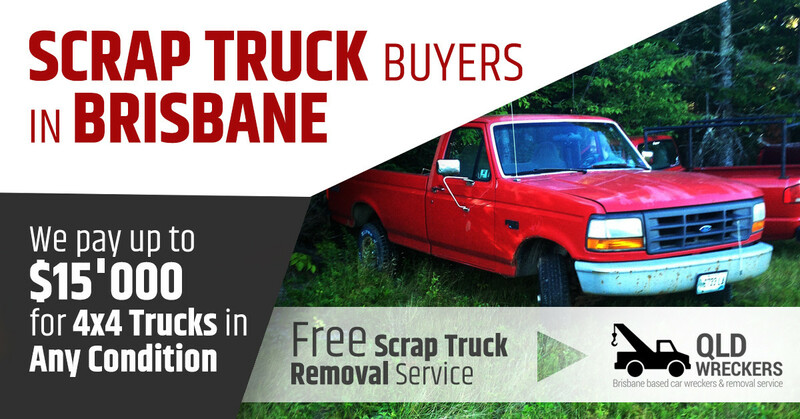 Here at QLD Wreckers, we give top cash along with free scrap truck pickups. Before selling your vehicle, you will definitely want to figure out how much value you can get for it. Of course, it is really fair to expect a reasonable price for your vehicle. That’s why we focus at paying top cash for trucks. To make things easy we even share free cash quotes that are totally obligation free. All you need to do is connect with our friendly team to get ultimate help. We generally give two options through which you can avail our services. First you can make us a quick call at: 0416 615 100. Or you can go to the main page on our website and find out the quote form. Just fill the required details in it and you are all set to receive a free truck valuation online. Remember to mention the following information when you contact us: the make, model, condition, age and kilometres travelled by your vehicle. This will help us to provide you the most accurate valuation when buying your broken truck for cash.